Steve who? 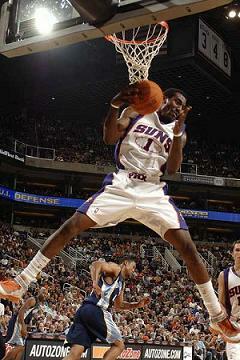 For fantasy purposes, the Suns are Amare's team. Stoudemire re-established himself as a fantasy behemoth last season, officially putting to rest any worries about his healthy or ability to dominate following microfracture surgery two years ago. Without seeing a dramatic increase in minutes, Stoudemire scored 25.2 points per game (almost five per game more than the previous season) while posting ridiculous percentages (.580 FG%/.805 FT%) and controlled the paint with 9.2 rebounds and a career-high 2.1 blocks per game. And Stoudemire actually got better after the Suns acquired Shaquille O’Neal, averaging better than 28 points per game in the final 25 games of the season. The only question is how Phoenix’s transition from a run-and-gun style under Mike D’Antoni to a more defensive-minded team under Terry Porter will effect Stoudemire’s performance. He will now be the focal point of a half-court offense and continue get his points on the break as well. Simply put: expect more dominance from Stoudemire. Bonus: he is now wearing goggles. When to take him: In the first four picks. Perhaps the player most affected by the Suns new team philosophy will be Nash. After all, he never averaged more than nine assists per game before playing under D’Antoni and has since managed at least 10.5 per game in four straight seasons. Last season, Nash handed out 11.1 assists per game and made a career-high 2.2 3-pointers per contest. His percentages were stellar (.504 FG%/.906 FT%) as usual but his scoring dipped nearly two points per game to 16.8. No longer playing in the “seven seconds or less” offense, expect Nash’s assists numbers to dip but his scoring should hold steady since he has developed into a such a tremendous shooter. He took a career high 381 3-pointers last season and STILL shot a career high .470 from the arc. An added benefit of the slowed (but hardly slow) offense is that his bloated number of turnovers – which was easy to live with anyway – should decrease. Instead of averaging 3.5 turnovers per game, that number should drop to less than three per game. Nash is still a superb offensive player who is surrounded by talent and that is plenty to make him an elite fantasy point guard. When to take him: In the second round. After emerging as one of the league’s best bench players two seasons ago, Barbosa was erratic at best as Nash’s backup in 2007-08. His scoring dropped 2.5 points per game to 15.6 because his FG%, FT% and 3-point % all fell significantly. As a result, he saw less than 30 minutes per game and his steals and assists declined, as well. But Nash is getting older (he’s 34) and the Suns are going to need big things from Barbosa to get through the season as a contender. That could lead to major minutes and an increased opportunity to boost his fading numbers. Barbosa is still only 26 and it’s entirely possible last season was just a minor bump in the road. Because of that bump, he’ll likely fall far enough in drafts to spot where he’s worth the risk. When to take him: In the eighth or ninth round. Hill found his way on to the Suns last season and managed to play in 70 games for the first time since 1999-2000 with Detroit (seriously). He has not played in 70 games in consecutive seasons since 1996-97 and 1997-98. Do with that information whatever you want. Hill’s value lies in the fact that he is terribly safe, like a show on the Disney Channel. His percentages are good and he does enough at each category to make you feel OK with having him in your lineup until his ankle falls off or someone forget to bring the oil can to the game. Even playing nearly 32 minutes per game last season, he barely did enough to truly help teams in assists and steals playing on one of the fast-breakingest* teams in the league. He’ll play the role of the backup ballhandler when Nash is out and may actually benefit from the transition to more of a half-court offense. Still, though. It’s Grant Hill. You know, Grant Hill. There is a reason why everyone thinks twice before drafting Grant Hill. Because he is, after all ….. Grant Hill. When to take him: In the 10th round. Bell was a borderline ownable player in most leagues before arriving in Phoenix, where he could shoot wide-open 3-pointers on the break and be the team’s toughest backcourt presence (the rest are pussies …. Nash is even Canadian!). But if the offense is going to play a more traditional style then Bell’s value is going to take a hit and if Porter doesn’t fall in love with him as D’Antoni did, his minutes could plummet. Bell’s saving grave is that there are not many other guards on the roster to steal his playing time and the team will likely need his 3-point ability. Regardless, he was once an elite 3-point specialist but he should now be considered a notch below. When to take him: In the 10th or 11th rounds. The ever-confusing Boris Diaw can provide some assists and FG% out of the center position and it wouldn’t be surprising if he benefitted from playing in the half-court offense. Shaquille O’Neal can still rebound, block shots and shoot a high percentage from the floor and his low FT% isn’t nearly as dangerous as it once was because he doesn’t get to the line much anymore. But he has played 61 games or less in each of the last four seasons. He might be worth a gamble if you need blocks or rebounds but he WILL get hurt at some point. Matt Barnesshouldn’t be drafted, but it wouldn’t be stunning if he wound up a better 3-point specialist than Bell. He’ll get some minutes, especially once Shaq gets hurt. * Yes, I made that word up. Be sure to check your league rules for specific position eligibility.